Since starting this website, I have been transporting my bikes a lot. During this process I have learned how easy it is to blow fork seals. Many of the shows we go to are a day or two away from Toronto and leaving my bike tied down for so long has wreaked havoc on my suspension. The folks over at www.King-Cold.com have a product that solves this problem and makes bike transportation a much easier task. 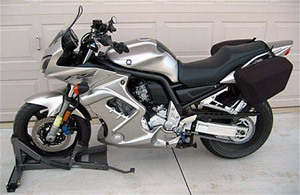 The WheelDock motorcycle transportation system has been designed to transport just about any motorcycle safely and securely. The unique design allows for one-person operation and ensures that your bike will be ready to ride when you arrive at your destination. The WheelDock is manufactured from rectangular steel and can be quickly attached and detached from your truck or trailer. The unit includes flush-mounting hardware and a wrench to make installation easy. The built in air spring makes operation simple and ensures your wheel is locked in securely (click here to view specifications). In addition to making transportation a breeze, the wheel dock can also be used on your garage floor or driveway. The upright position makes cleaning and repairing your bike a cinch. Those of you who miss the days of the center-stand will love this product! Click here to view the WheelDock video. The WheelDock comes in a range of models for sport bikes, dirt bikes and cruisers. Cost is $295 US and includes a 60-day guarantee and limited lifetime warranty. For more information or to purchase a WheelDock visit www.King-Cold.com.